The Department of Education is located at Frescativägen 54, behind the Natural History Museum. Be aware that the signs on campus state address of buildings and not the department name. From Stockholm Central Station, take the subway towards Mörby Centrum to "Universitetet". Upon exiting the subway station, take a left and follow the signs towards the Naturhistoriska riksmuseet (The Natural History Museum). Before the main entrance to the museum, follow the signs to Frescativägen 54. Coming from Stockholm city centre, choose bus 50 towards Stora Lappkärsberget. The closest bus stop is "Bergiusvägen". The train station is called "Universitetet". After the stairs take an immediate right which leads to the subway and bus station. From the bus station, follow the signs to the Naturhistoriska riksmuseet (The Natural History Museum). 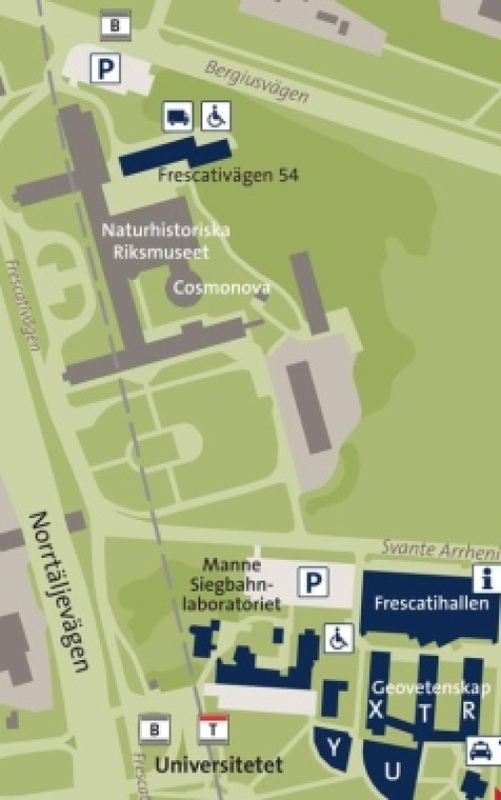 Before the main entrance to the museum, follow the signs to Frescativägen 54. The closest entrance accessable by car is Frescativägen 50, which is on the north side of the building. At this entrance, there is parking for disabled and taxi. The Department of Education is located on the 4th-7th floor. Parking is located at the corner of Frescativägen/Bergiusvägen.